... and could result in sharply higher bond yields, the BOJ scrambled to avoid an adverse reaction by the market, when overnight BOJ Governor Haruhiko Kuroda joined the rest of his central bank peers in making a hard-dove turn, saying on Tuesday the central bank was ready to ramp up stimulus if sharp yen rises hurt the economy and derail the path toward achieving its 2 percent inflation target. 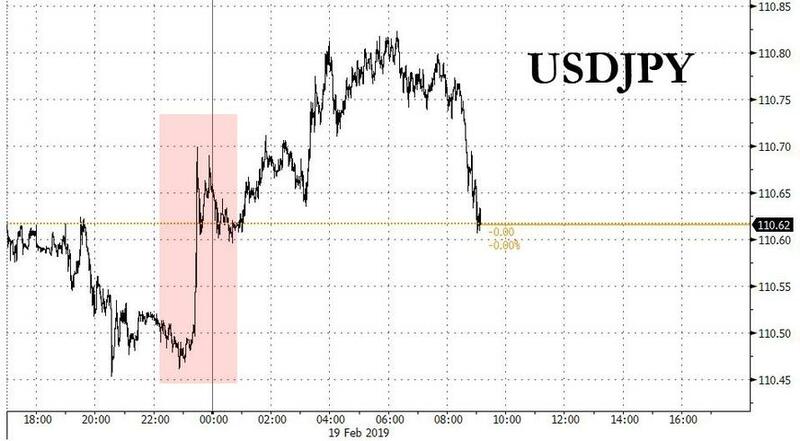 The yen promptly tumbled after Kuroda’s comments, which confirmed that the BOJ has now officially jointed the race to the currency bottom, launched by the Federal Reserve, which shocked everyone by turning full-blown dove last month, and dragging the rest of the world's central banks with it. "If currency moves are having an impact on the economy and prices, and if we consider it necessary to achieve our price target, we’ll consider easing policy,” Kuroda said, repeating that possible easing tools the BOJ could deploy included cutting short- and long-term interest rates, expanding asset buying or accelerating the pace of money printing. That said, considering that the BOJ is rapidly running out of stuff to buy, as it already owns over 40% of the country's bonds and about 80% of its equity ETFs, the BOJ chief said the central bank would "carefully consider the benefits and costs of any further policy easing", suggesting that the hurdle for topping up stimulus would be high given how financial institutions’ profits have been hurt by years of near-zero interest rates. “Whatever we do, however, we need to carefully balance the benefits and the costs of the step such as the impact on financial intermediation and market functioning." Kuroda was responding to a question by an opposition lawmaker on whether the BOJ had the necessary tools to boost stimulus to counter the pressure from a sharp yen rise. Offsetting Monday's weakness which we discussed overnight, Japanese government bond prices turned higher and the yen slumped. Like every other activist central bank, the BOJ faces a dilemma as years of heavy money printing has dried up market liquidity and hurt commercial banks’ profits, stoking concern over the rising risks of prolonged easing, with the risk of an out-of-control yield surge and inflation explosion threatening the economy should the BOJ lose control. And yet, subdued inflation - due to the BOJ's relentless monetization of the long-end - has left the BOJ well behind its U.S. and European counterparts in dialing back crisis-mode policies, leaving it with little ammunition to battle an abrupt yen spike that could derail an export-driven economic recovery. Meanwhile, growing fears of a global slowdown (thanks China and Europe) have added to the BOJ’s headaches and shifted the market’s attention away from the likelihood of a future exit from easy-policy, especially as many major central banks have shifted their position over recent months toward an accommodative stance. 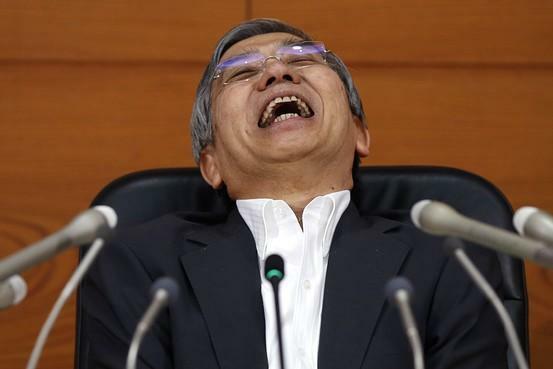 Confirming that the BOJ is effectively trapped in perpetuity, Kuroda also said the BOJ had no plans now to stop or review its purchases of ETF, despite growing criticism from market players that the central bank’s huge presence was distorting the market. And while Kuroda conceded the BOJ is now impacting the equity amrket, he added the BOJ will scrutinize the most appropriate means to balance the pros and cons of its policy. 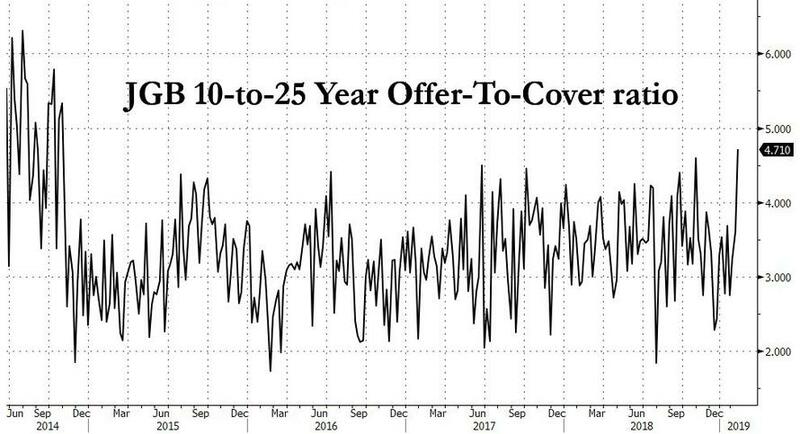 “We will continue our ETF buying while taking into account market moves and the impact on financial institutions, as well as economic and price developments,” Kuroda said. In other words, nothing will change until one day the market revolts and forces the BOJ to act.